Mamma Mia the first (and arguably the best) of the latter-day juke box musical genre, was born more than 15 years ago from the timeless legacy of Sweden's most famous export, the 1970's supergroup Abba. Sometimes schmaltzy for sure, but Benny Anderson and Björn Ulvaeus' lyrics speak of ordinary lives, of simple relationships and of familiar loves and losses. Most of human life is wrapped up in one or t’other of their songs and it is a testament to Catherine Johnson that her book, woven around a selection of Abba’s greatest hits, works so well. Superficially, the narrative follows a gloriously honeyed and nigh on implausible tale of 20 yo Sophie trying to find her dad amongst a possible three of mum Donna's former fellas. The show is of course a modern day fairy-tale, for scratch the surface and the emotions that underlie Sophie's quest are raw, relevant and above all recognisable. Her sometimes angst at having grown up fatherless strikes a contemporary chime, whilst Donna's gloriously feisty and strong independence is a sincere carapace that nonetheless surrounds a post-modern woman still craving love. Johnson is a genius, for as well as creating a mother and child whose arcs we care about, she adds two of Donna's outrageous old friends Tanya and Rosie for chick-flick comedy. Stir in the three potentially paternal old flames of Donna, who each have to consider that they may well have sired Sophie before unwittingly abandoning a young mum to be, and its all rather cheesy but actually rather brilliant. There’s some smashing ensemble work too with Anthony van Laast’s choreography still proving that young men in latex and spandex, with flippers in place of tap shoes, make for a dance routine that will never age. And what of this most recent cast? Dianne Pilkington's Donna gets the blend of sassy with mumsy just right, coaxing "ah's" from the audience with I Do, I Do, having previously shredded the heart strings of most parents in the house singing the painfully perceptive Slipping Through My Fingers. Alice Stokoe makes her West End debut with an impressive and slick soprano Sophie. Kim Ismay and Rebecca Lock’s Tanya and Rosie respectively provide (most of) the evening’s laughs, Ismay in particular proving why she has defined her man-eating cougar over the years. Amongst the dads (all top chaps, to a man) the chiseled presence of Richard Trinder’s Sam Carmichael adds an almost believable credibility to the wonderfully ridiculous fairy-tale ending. There aren't too many shows around that, sixteen years on, can still pack a Monday night theatre. The audience ranged from school parties through to middle-aged business men and grinning septuagenarians all blended in with a selection of tourists that outmatched the United Nations for variety. 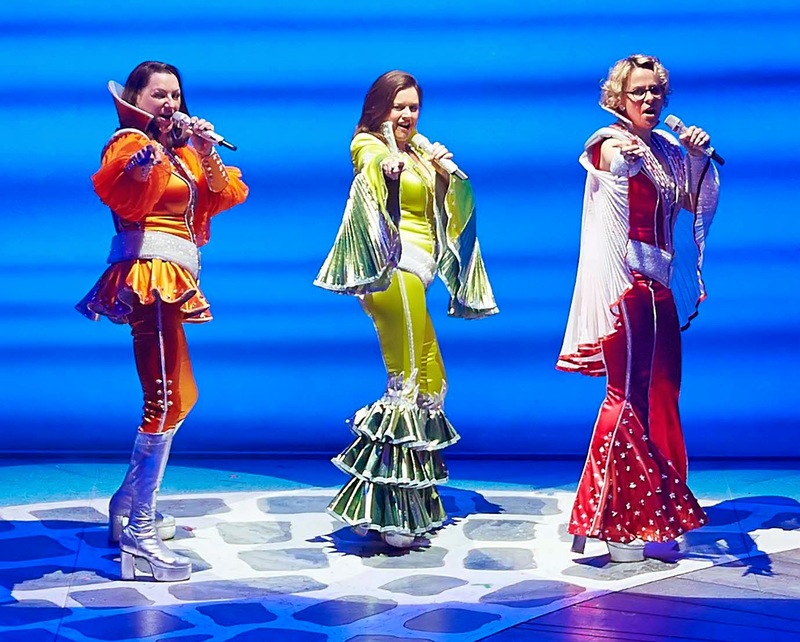 Mamma Mia remains flawless entertainment and another example of London's West End at its very best.